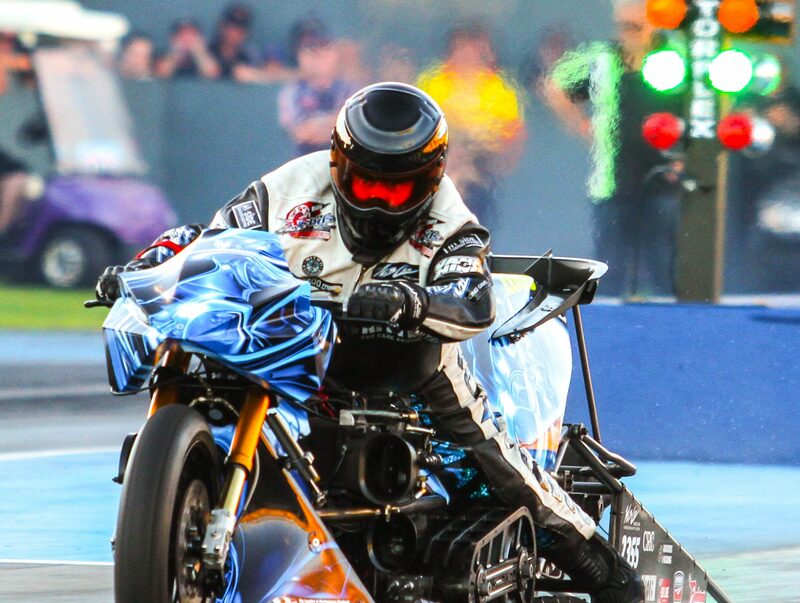 Chris Matheson – Australia’s quickest and fastest man on a motorcycle, and current Top Fuel motorcycle champion is preparing to travel from his home base in Brisbane to Perth to compete at the 47th annual Mac Track Westernationals on March 3 & 4. 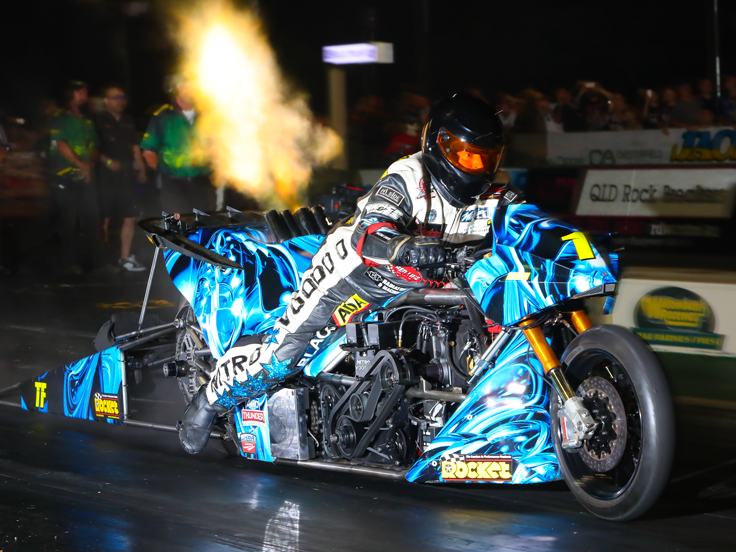 This prestigious drag racing event will feature Rd 4 of the 400 Thunder Top Bike Championship and is sure to pack plenty of punch with some of the toughest two-wheel nitro warriors in Australia ready to rumble. The journey will see Matheson clock up almost 10,000 km or 6,000 miles, taking in almost 110 hours of driving! He will no doubt have plenty of time to see the beauty of the Australian outback, but more importantly, think and plan his attack! In the meantime, Matheson is still smiling following his win in Sydney at the Santo’s Summer Thunder event on January 20th. The 4 x Champ dominated the class by top qualifying, setting Low ET and Top Speed. His “Nitro Voodoo” machine blasted out a 6.10 elapsed time with an early shut off 212 mph (330kph), defeating Rod Barchet on his nitrous-powered machine. In earlier rounds, Matheson dispatched former Champ Mark Drew who had a weekend he’d rather forget, and longtime rival Chris Porter struggled with a new clutch combination that ultimately damaged his Harley-Davidson V-Twin. In between all the drama, local rider Barchet was creeping up on his consistent hard-hitting nitrous machine, however, all the attention went to relative Top Bike rookie Adam Layton who ran an impressive PB 6.49 ET with an early shut off on his Harley-Davidson. Matheson said Sydney was a good result but that goes to the history books and we now have a clean sheet heading to Perth. “We love the Perth round of the championship. It’s a big drive over and back but well worth it,” said Matheson. “The fans love the bikes and we virtually always have an oversubscribed field of fuel bikes at Perth. It’s always a great meeting. “There is no doubt the WA boys will be out to beat us and send us packing home with our tail between our legs. “We have made many trips across the desert to run against some of the quickest riders in Australia but this time around we are focused on taking the track record at Perth. It’s a must-have on my list. Let me tell you I won’t be just coming to make up the field! “I’m looking for a win and to break the track record currently held by Jay Upton with a 6.11. Our best there is 6.12,” said Matheson. “The “Nitro Voodoo” bike has been turned around since our win in Sydney and is ready to be loaded into our newly wrapped transporter for the long haul to WA. While Matheson will be taking in all the driving duties, he does enjoy the solitude and adventure of travelling out in the centre. “I’ll be listening to The Stranglers and making a few stops at some very special places. You just don’t know who or what you will come across or see. But’s that all part of the adventure,” finished Matheson. Matheson and his “Nitro Voodoo” machine sit on top of the 2017/18 400 Thunder Top Bike Championship with 287 points and is followed by Adam Layton (169), Chris Porter (NSW), Mark Drew (142) and rounding out the Top 5 is Rod Barchet (66).